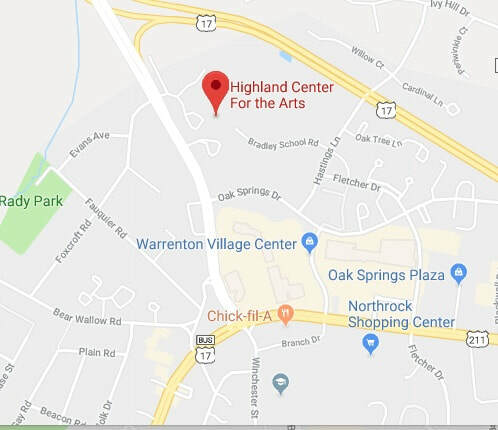 The Highland Center for the Arts is just north of the Warrenton Village Center (Rankins Hardware, Staples, Petco, etc.). Turn into the Highland School main entrance. The Center for the Arts is the leftmost building. The Fauquier Community Band's spring concert, “Movie Music” will be presented Monday, May 13, at 7:00PM. In keeping with the Band's tradition of appealing to audiences of all ages, the music is drawn from movies spanning six decades—from Ben Hur to How to Train Your Dragon. And the mood swings from red hot Chicago to the soothing lullaby from Life of Pi. There is no admission charge and seating is first-come, first-served. There will be a prize raffle (one dollar per ticket) to benefit the Band, and the audience is cordially invited to join Band members for a dessert reception after the concert. Multiple bands will be playing from 2PM-6PM. Fauquier Community Band will play at 3PM. Tentative. Check back for more info.